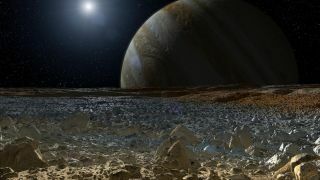 Artist's concept showing a simulated view from the surface of Jupiter's moon Europa, with the giant planet looming over the horizon. At 1,900 miles (3,100 kilometers) wide, Europa is only slightly smaller than Earth's moon. But the Jovian satellite is very different from the one that lights up Earth's night sky; Europa is covered by a shell of ice, beneath which sloshes an ocean of liquid water. Scientists think this ocean is in contact with Europa's rocky mantle, making possible a variety of complex chemical reactions. Indeed, the Europan sea may be capable of supporting life as we know it, which explains why astrobiologists have long dreamed of launching a probe to the icy world. They will get their wish relatively soon. On May 26, NASA announced the nine science instrumentsthat will fly aboard the agency's Europa spacecraft, which is scheduled to blast off in a decade or so. That gear includes high-resolution cameras, ice-penetrating radar, a heat detector and other equipment. The probe will reach Jupiter orbit and then use these instruments to study Europa's frigid surface and underground ocean during 45 flybys of the moon over the course of about two and a half years. The goal of the as-yet-unnamed Europa flyby missionis to better understand the moon's ability to support life, not search for signs of alien organisms. As exciting as a Europa life hunt would be, NASA is just not ready to take that step yet, agency officials said. Bolden said that people who are frustrated with the scope of the first Europa mission should exercise a little patience, for the agency does not envision a one-and-done effort at the Jupitermoon. "My friends in the science community — they don't have a lot of faith, either in us at NASA or in Congress, to fund another Europa mission, so they'd like to get everything on this first mission," he said at the Aerojet Rocketdyne facility on May 26. "That is a sure recipe for disaster, when you try to do all things with one vehicle. We need to do incremental approaches to studying Europa," Bolden added. "We're going to fly a Europa mission in the 2020s sometime, and hopefully, what we find will whet our appetite and there will be follow-on Europa missions." Indeed, NASA is already thinking, in a preliminary sense, about possible next steps at Europa, said Jim Green, head of the space agency's Planetary Science division. "At this stage, we are doing some studies — very elementary studies — about landed missions," Green said during the May 26 science-instrument news conference. NASA tends to study alien worlds in a series of increasingly ambitious steps; a flyby generally comes first, followed by an orbital mission and then a lander or rover. But the initial Europa effort, with its 45 flybys, will basically serve as an orbital mission in terms of science return, Green said, so putting a probe down on the moon's surface is the logical next step. Indeed, the flyby probe will, in some ways, serve as a scout, returning supersharp images and other data — such as information about the thickness of Europa's ice shell — that will help researchers plan out a potential surface mission in the future. "We actually don't know what the surface of Europalooks like at the scale of this table, at the scale of a lander — if it's smooth, if it's incredibly rough, if it's full of spikes," Niebur said. "Without knowing what the surface even looks like, it's difficult to design a lander that could survive." Ideally, Green said, a landed mission to Europa would not be restricted to its surface. Rather, the mission would get beneath the moon, coming into contact with the ocean, or at least with smaller pockets of liquid water trapped under the ice. "It'd be great to think that the results from this particular mission would lead, in the next decade, to some new and exciting concepts about potentially getting underneath the ice shell," Green said. "We need to really make those steps — methodical steps in scientific understanding — to determine indeed if this body can be penetrated in a way to be able to get under the ice shell," he added. "But that's, indeed, in the distant future."